NOTCOT Note: Here’s another post from our friends at Sub-Studio! Keeseh Studio is a design studio run by two talented RISD grads, Asher Dunn and Shane Richards. Both graduated this year - I was impressed by the quality of their student work and am looking forward to see what comes out of their studio this coming year. 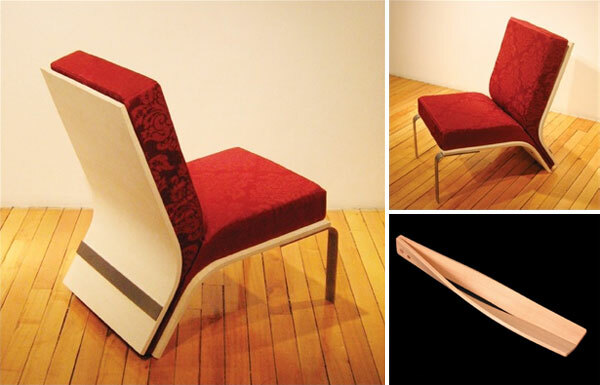 Above is Asher’s Upholstered Chair - I love the bent laminate chair shell - how the back curves to form the rear legs and how it sandwiches the cushions together. Also shown is his Serving Utensil, a nice translation of a common household object. Asher’s Expanding Chair - it collapses for easy transport and expands into a full seat when needed - and the Stacking End Tables, which look like little jellyfish. I love the painted side edge. A collection of very creepy/cool marionettes by Shane Richards. Check out more Keeseh Studio work at their website.